Welcome to the final day of the 4th Annual Handmade Holidays Blog Hop! We hope you enjoyed the projects from the last 2 days! A few years ago we were looking online for handmade gift ideas and thought it would be great if there was a resource dedicated JUST to handmade gift ideas. Enter the Handmade Holidays hop! We've gathered over 100 of our creative blogger friends in the craft industry as well as some of our fellow product manufacturers to bring you a plethora of inspiring gift ideas you can make now to give to your friends, family, and colleagues. 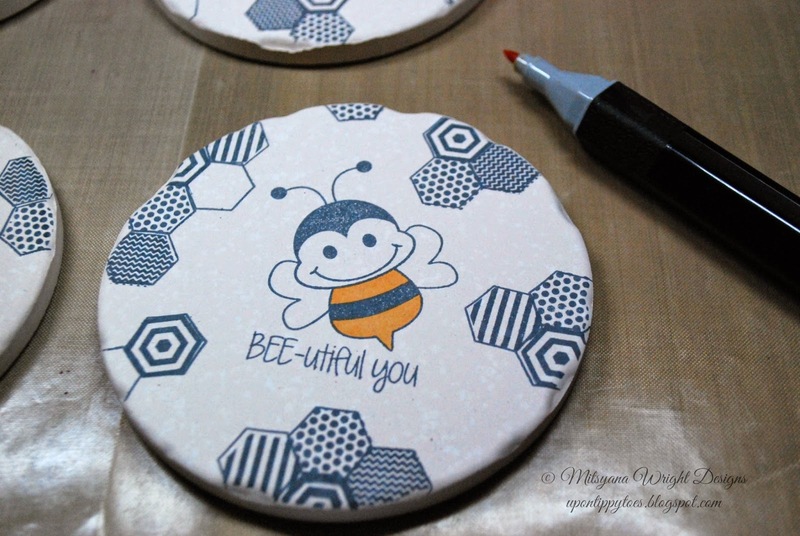 Today's handmade gift I will be showing you how to make hand-stamped stoneware drink coasters. All you need are a few supplies. I bought mine from my local super center/ grocery market. 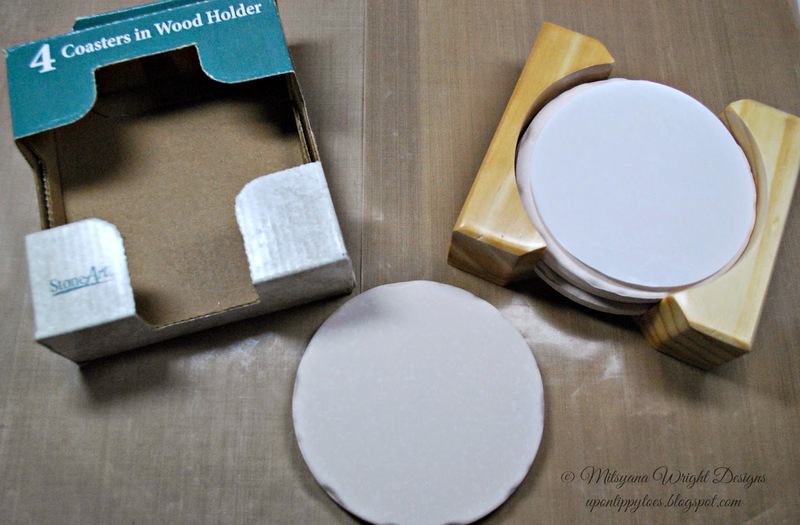 The bottoms came pre-corked to prevent scratching and they came with a neat wooden holder to house them in while not in use. 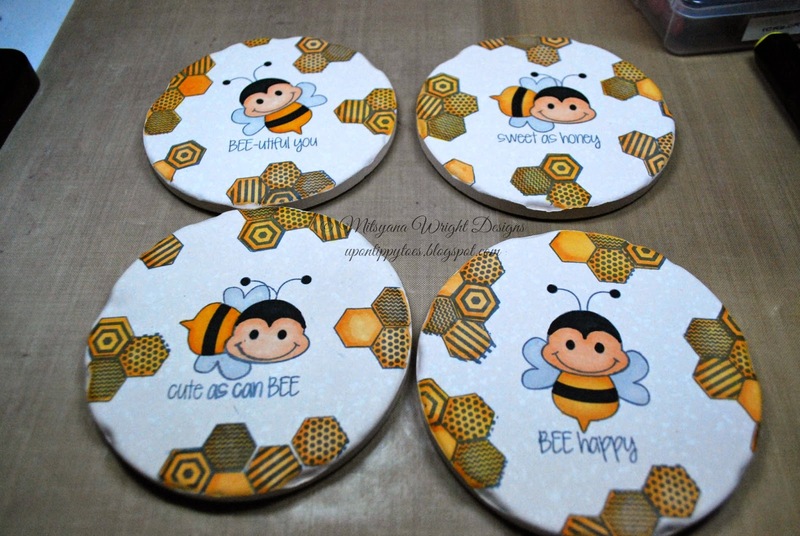 For my project I used Pink and Main's Bee Happy stamp set. 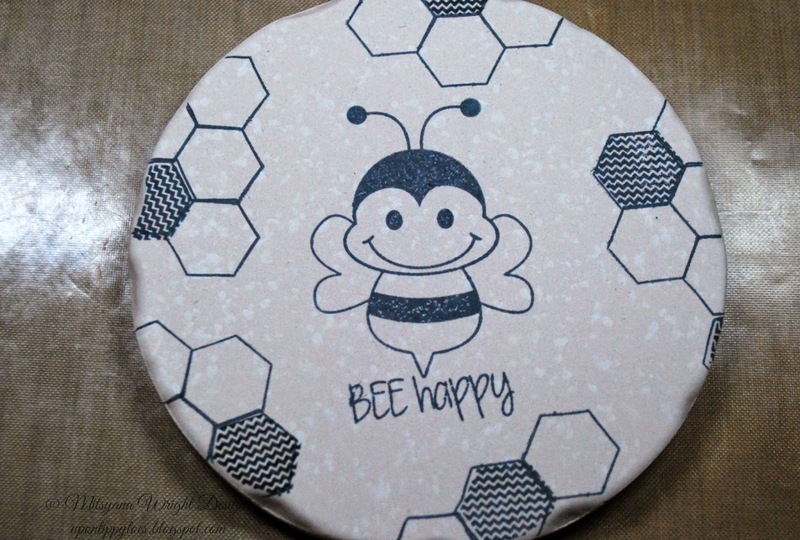 It has very cool mix-n-match hexagons that I am just ga-ga over!! 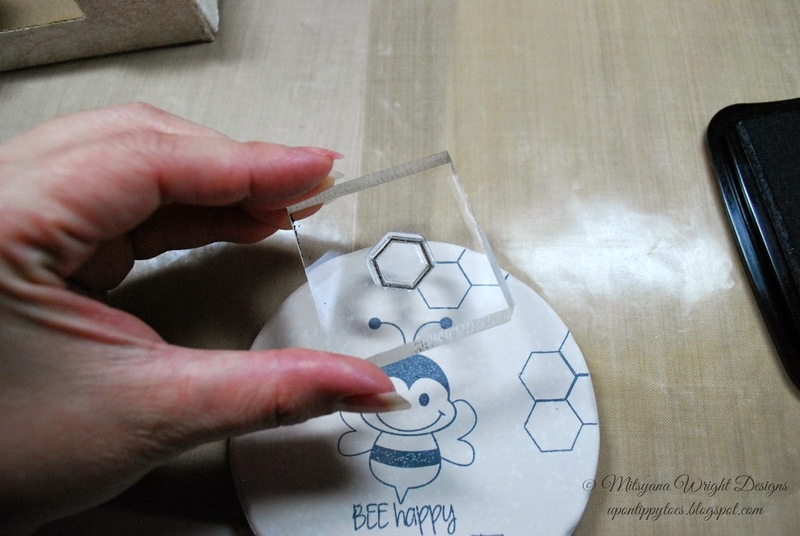 Prep you coaster for stamping. 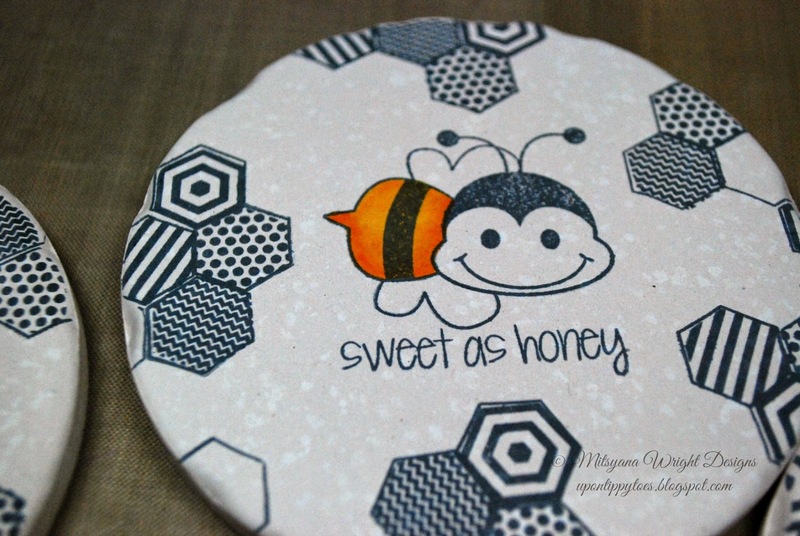 Dust and dirt may have collected on the surface of your coasters. You want to work on a clean surface so your ink lays down nicely and your image is crisp and clear. To do this simply rinse with warm water or wipe down with a damp wash cloth and let it dry completely. 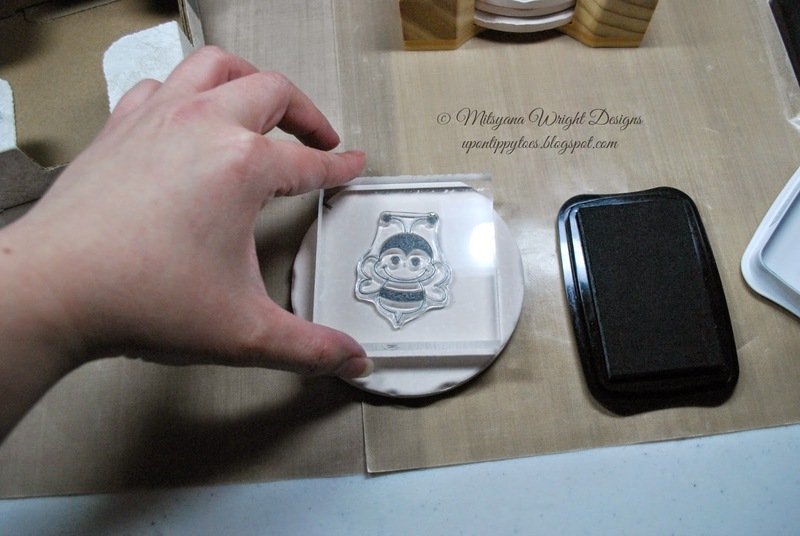 Stamp image onto coaster using your dye based ink pad. Using a dye based is important because the ink becomes permanent once it is dried. We don't want all our hard work ruined from runny ink. I used a ink pad that plays well with alcohol inks and water colors. Certain ink pads, even dye based ones, have a tendency to smear when coloring. 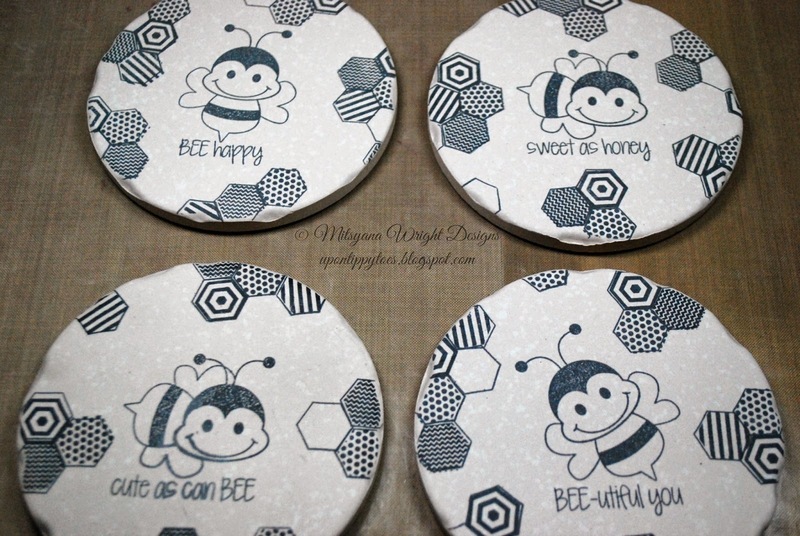 Here are those cool mix-n-match hexagon I talked about earlier. And because the are see-through they make for easy alignment and placement every time! Color in with your alcohol ink markers.This is also important. Again, we want to use a product that is going to be permanent when dried.You have to remember that these are for setting down drinks... condensation from cold beverages are going to pool on top the surface. Start with your lightest color as your base. Add and blend the darker shades in areas you think will cast a shadow. Do the same on the rest of the stamped images. When using a heat gun, you must remember that you will be heating up stone, not paper. Drying times on stone, even with a heat gun, are different from drying time on paper. AND, also remember to put protect your work surface. 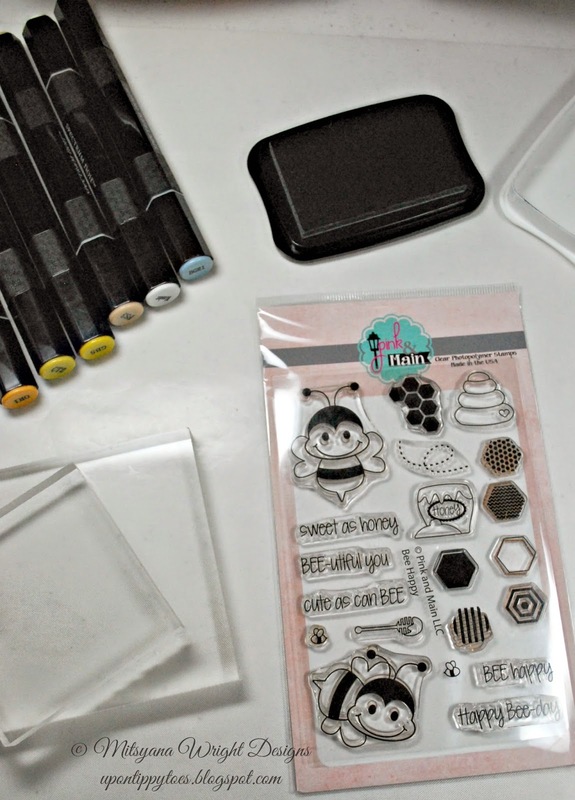 Use a silicone sheet or craft sheet when heating your tiles... They WILL get very HOT! Always, always, always use your heat tool with caution and keep out of the reach of children (and pets)! We don't want little hands and feet (or paws) to get burnt! Some people just like having a extra layer of protection. But there isn't a real need for it unless you didn't use alcohol inks to color your image. If you do choose to seal your project stay away from aerosols. They tend to be alcohol based and will ruin your project and make the inks run and bleed. Now, just need to wrap up your gift and give to a friend or loved one!! Hope you enjoyed this handmade gift project! 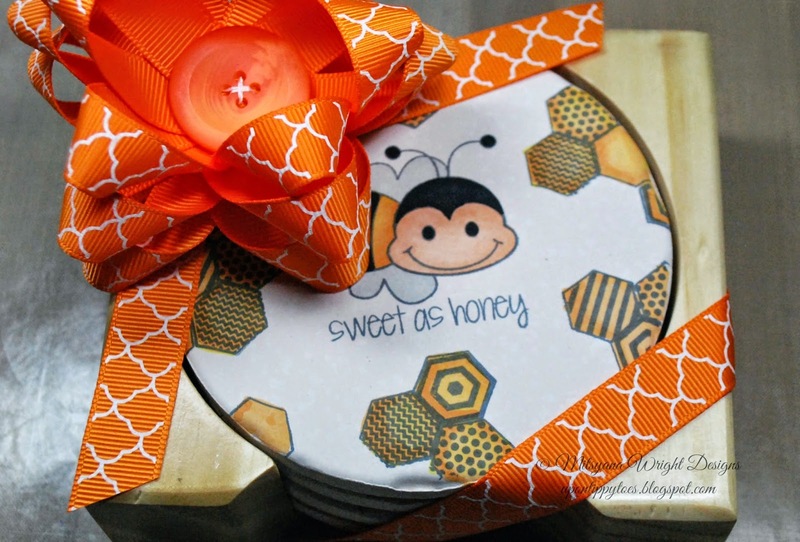 Are you ready for lots more creative handmade gift ideas and projects?? 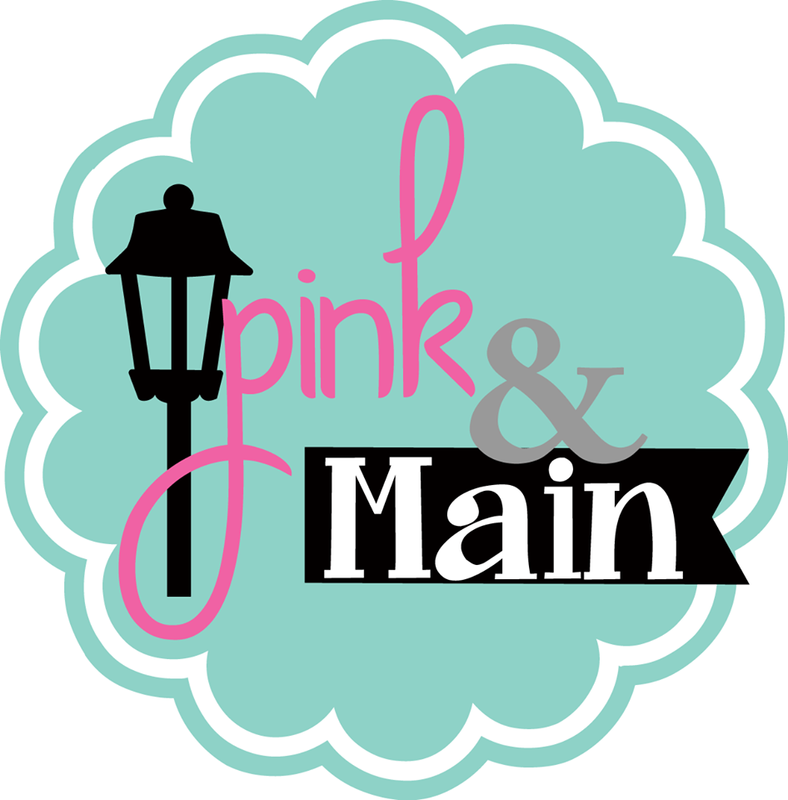 Follow along on our blog hop! Simply click on each of the links below to be taken to that post with additional information and photos on how to create a handmade gift project. Have fun and pin away! A huge thank you to our sponsors for this hop - please visit their blogs & websites below and follow them. And be sure to come back tomorrow for another 30+ amazing Handmade Gift Ideas! WOW! Such a great idea. Your project is so darn cute. TFS!! Those are just so cute! 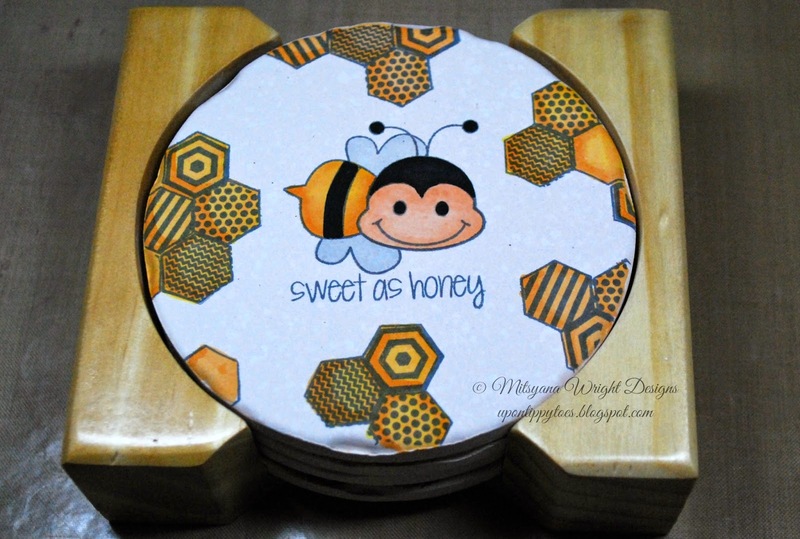 I love that little bumble bee, and the hexagon stamp is great too! Thank you so much! I'm glad you liked it! OMG!!! This is too cute!! !